Ceramic water pipes designs are judged on how effective they are, yes, but that’s not all they’re judged on. We offer many different ceramic water pipes that are durable. Our ceramic water pipes products all come in at reasonable prices. However, so much of what makes a good ceramic water pipe is the design. These aren’t just water pipes, they’re art pieces. Your customers buy them to make an artistic statement. So, to offer your customers the ceramic water pipes they want, we’ve made sure to offer some of the best, most eye-catching designs anywhere. In this blog, we’ll go over some styles that our ceramic water pipes wholesalers offer. Some of the most popular ceramic water pipes designs are all firearms. The standing pistol is particularly beloved, but that’s far from the only kind of gun that we offer. For example, the double-barreled shotgun is one that people are really falling in love with. The standalone pistol has plenty of fans, as it’s made to look as realistic as possible. When looking at standing pipes that feature guns, the base is important, too. That’s why we have some ceramic water pipes with a horse design on the base as well as others with a skull design. People want a ceramic water pipe that speaks to them and who they are. Skulls and other symbols traditionally associated with death and the supernatural are some of the most enduring designs of ceramic water pipes, year in and year out. We offer a simple “skull with tube” design, as well as the far more intricate “stack of skulls,” which is (as you might imagine) several skulls stacked atop one another. 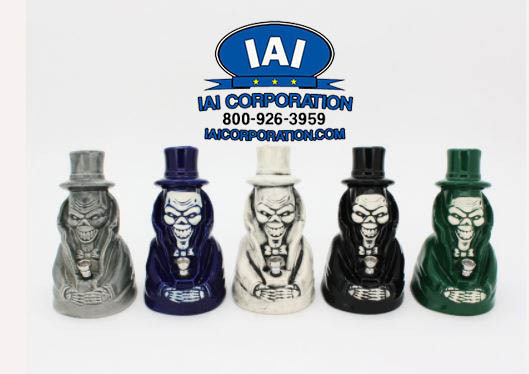 Our “Death Reaper” ceramic water pipe captures the solemnity that Death is often associated with, while the “smirking skull with a top hat” has a true “devil may care” feel to it. The “old man reaper” feels like a ceramic water pipe with a story to tell, while “the skeleton violinist” really shows off the kind of artistry that is capable of ceramic water pipes. So-called “fantasy” designs of ceramic water pipes have never been more popular. That includes designs like our “snake queen,” who looks like she could step out of any popular TV or movie fantasy franchise. The same goes for all of our exquisite “dragon” designs. “Baby Dragon,” “grinning dragon,” there’s something appropriate and fitting about a dragon, an impossible, intimidating creature who breathes fire, associated with a ceramic water pipe. Magicians and wizards are included in our ceramic water pipes, too. These designs really show off the range of what ceramic water pipes can be made into. There’s so much more to ceramic water pipes designs than just skulls, dragons or other supernatural entities. For example, we have a simple “peace sign” as well. This design of ceramic water pipes has been around for a long time and will continue to be around for long. They convey a simple, enduring message very quickly. Another ceramic water pipe that conveys a simple message in a brief period of time (albeit the exact opposite one) is our upraised middle finger ceramic water pipe. 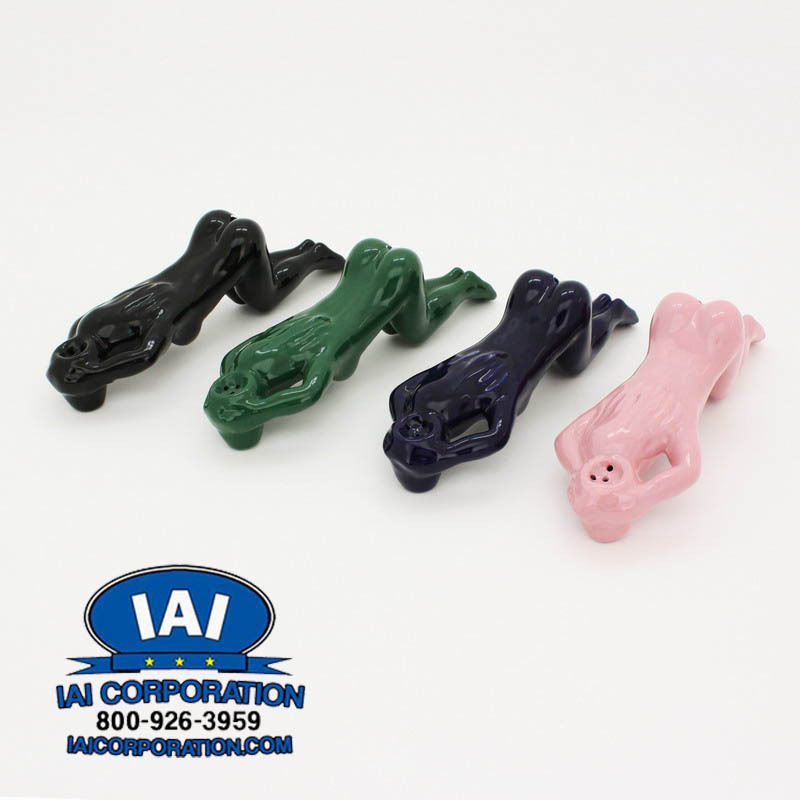 We have the kinds of water pipes that let your customer makes the statement they want to make. Some of you may be reading this and think “my customers are just going to want regular ceramic water pipes. No designs, just a great water pipe that works.” We hear you. We have several water pipes that are just that. You can get pipes that are just a ladle with a base, one with a squared scoop, a beaker with a twisted tube, one with a bent ladle and so many others. No matter which of our designs of ceramic water pipes you get, you and your customers are going to get a great ceramic water pipe that can perform all of the tasks it will be asked to. In the end, our ceramic water pipes (as well as the rest of our products) are designed to give you a competitive advantage in the industry. We make sure to keep our prices low. That way, you can create a profitable business no matter your size. We have clients that have a huge national chain, with stores all across America (and elsewhere). We also have clients who have one store. Regardless of your size, we can work with you to offer you the exact right kind of smoking accessories for what your customer want. Selection and quality are two things we can always offer our customers. We make sure to offer products to appeal to those who have been smoking for decades as well as those who just started. To learn more, give us a call at (800) 926-3959 or head to our site.